Like the hands in Escher's engraving, this book has followed a circular route. We began with the features of our experience common to our shared social life. From that starting point we moved on to cellular autopoiesis, the organization of metacellulars and their behavioral domains, the operational closure of the nervous system, the linguistic domains, and language. Along the way, we put together the building blocks of an explanatory system capable of showing how the phenomena proper to living beings arise. We came to see how social phenomena founded on a linguistic cou­pling give rise to language and how language, from our daily experience of cognition, enables us to explain its origin. The beginning is the end. We have thus completed the task we set for ourselves, namely, that a theory of knowledge ought to show how knowing generates the explanation of knowing. This situation is very different from what we usually find, where the phenomenon of explaining and the phenomenon explained belong to different domains. Now, if the reader has followed seriously what was said in these pages, he will be impelled to look at everything he does — smelling, seeing, building, preferring, rejecting, conversing — as a world brought forth in coexistence with other people through the mechanisms we have described. If we have lured our reader to see himself in the same way as these phenomena, this book will have achieved its first objective. Doing that, of course, will put us in a circular situation. 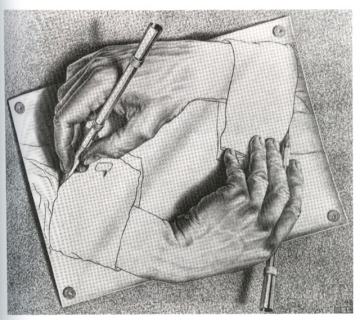 It might leave us a bit dizzy, as though following the hands drawn by Escher. This dizziness results from our not having a fixed point of reference to which we can anchor our descriptions in order to affirm and defend their validity. In effect, if we presuppose the existence of an objective world, independent of us as observers and accessible to our knowledge through our nervous system, we cannot understand how our nervous system functions in its structural dynamics and still produce a representation of this independent world. But if we do not presuppose an objective world independent of us as observers, it seems we are accepting that everything is relative and anything is possible in the denial of all lawfulness. Thus we confront the problem of understanding how our experience — the praxis of our living — is coupled to a surrounding world which appears filled with regularities that are at every instant the result of our biological and social histories. Again we must walk on the razor's edge, eschewing the extremes of representationalism (objectivism) and solipsism (idealism). Our purpose in this book has been to find a via media: to understand the regularity of the world we are experiencing at every moment, but without any point of reference independent of ourselves that would give certainty to our descriptions and cognitive assertions. Indeed, the whole mechanism of generating ourselves as describers and observers tells us that our world, as the world which we bring forth in our coexistence with others, will always have precisely that mixture of regularity and mutability, that combination of solidity and shifting sand, so typical of human experience when we look at it up close. Nonetheless, we evidently cannot break away from this circle and step out of our cognitive domain. It would be like changing — by divine fiat — the nature of the brain, changing the nature of language, and changing the nature of our becoming. We would be changing the nature of our nature. The fact remains that we are continuously immersed in this network of interactions, the results of which depend on history. Effective action leads to effective action: it is the cognitive circle that characterizes our becoming, as an expression of our manner of being autonomous living systems. Through this ongoing recursiveness, every world brought forth necessarily hides its origins. We exist in the present; past and future are manners of being now. Biologically there is no way we can put in front of us what happened to us in obtaining the regularities we have grown accustomed to: from values or preferences to color qualities and smells. The biologic mechanism tells us that an operational stabilization in the dynamics of the organism does not embody the manner in which it originated. The business of living keeps no records concerning origins. All we can do is generate explanations, through language, that reveal the mechanism of bringing forth a world. By existing, we generate cognitive "blind spots" that can be cleared only through generating new blind spots in another domain. We do not see what we do not see, and what we do not see does not exist. Only when some interaction dislodges us — such as being suddenly relocated to a different cultural environment — and we reflect upon it, do we bring forth new constellations of relation that we explain by saying that we were not aware of them, or that we took them for granted. That whole kit bag of regularities proper to the coupling of a social group is its biologic and cultural tradition. Tradition is not only a way to see and act, but also a way to conceal. Tradition consists of all those behaviors that in the history of a social system have become obvious, regular, and acceptable. Since they do not require reflection to be generated, they are invisible unless they fail. That is when reflection steps in. All that we have in common as human beings is a biological tradition. It began with the origin of reproduction in autopoietic systems and a cultural tradition that started a few million years ago with the hominid lineage. This common biological heritage is the basis for the world that we human beings bring forth together through congruent distinctions. Despite those distinctions, nature is the same for all: we all agree that the sky is blue and the sun rises every day. At the same time this common biological heritage allows a divergence of cultural worlds brought forth through the constitutions of what can become widely different cultural traditions. Thus, human cognition as effective action per­tains to the biological domain, but it is always lived in a cultural tradition. The explanation of cognitive phenomena that we have presented in this book is based on the tradition of science and is valid insofar as it satisfies scientific criteria. It is singular within that tradition, however, in that it brings forth a basic conceptual change: cognition does not concern objects, for cognition is effective action; and as we know how we know, we bring forth ourselves. Knowing how we know does not consist of a linear explanation that begins with a solid starting point and develops to completion as everything becomes explained. 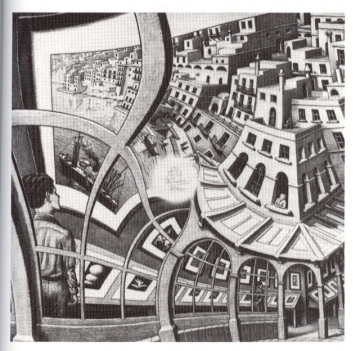 Knowing how we know is rather like the boy in Escher's Picture Gallery. The picture he looks at is gradually and imperceptibly transformed into . . . the city where the gallery and the boy are! We are unable to locate the starting point: Outside? Inside? The city? The boy's mind? Recognizing this cognitive circularity, however, does not constitute a problem for understanding the phenomenon of cognition. On the contrary, it constitutes the starting point that enables us to explain it scientifically. When Adam and Eve ate the fruit of the tree of the knowledge of good and evil, says the Bible, they were transformed into different beings, never to return to their initial innocence. Before, their knowledge of the world was expressed in their nakedness. They went about with that nakedness in the innocence of mere knowing. Afterward, they knew that they were naked; they knew that they knew. In this book we have harked back to the "tree of knowledge." We have invited the reader to eat the fruit of that tree by offering a scientific study of cognition as a biological phenomenon. If we have followed its line of reasoning and imbibed its consequences, we realize that they are inescapable. The knowledge of knowledge compels. It compels us to adopt an attitude of permanent vigilance against the temptation of certainty. It compels us to recognize that certainty is not a proof of truth. It compels us to realize that the world everyone sees is not the world but a world which we bring forth with others. It compels us to see that the world will be different only if we live differently. It compels us because, when we know that we know, we cannot deny (to ourselves or to others) that we know. That is why everything we said in this book, through our knowledge of our knowledge, implies an ethics that we cannot evade, an ethics that has its reference point in the awareness of the biological and social structure of human beings, an ethics that springs from human reflection and puts human reflection right at the core as a constitutive social phenomenon. If we know that our world is necessarily the world we bring forth with others, every time we are in conflict with another human being with whom we want to remain in coexistence, we cannot affirm what for us is certain (an absolute truth) because that would negate the other person. If we want to coexist with the other person, we must see that his certainty — however undesirable it may seem to us — is as legitimate and valid as our own because, like our own, that certainty expresses his conservation of structural coupling in a domain of existence — however undesirable it may seem to us. Hence, the only possibility for coexistence is to opt for a broader perspective, a domain of existence in which both parties fit in the bringing forth of a common world. A conflict is always a mutual negation. It can never be solved in the domain where it takes place if the disputants are "certain." A conflict can go away only if we move to another domain where coexistence takes place. The knowledge of this knowledge constitutes the social imperative for a human­centered ethics. 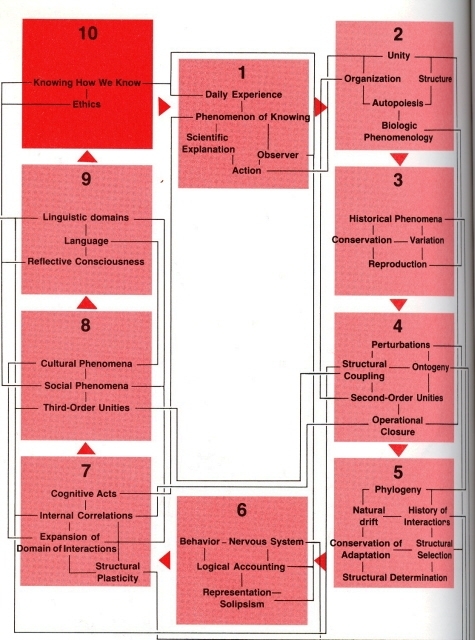 What biology shows us is that the uniqueness of being human lies exclusively in a social structural coupling that occurs through languaging, generating (a) the regularities proper to the human social dynamics, for example, individual identity and self-consciousness, and (b) the recursive social human dynamics that entails a reflection enabling us to see that as human beings we have only the world which we create with others — whether we like them or not. Biology also shows us that we can expand our cognitive domain. This arises through a novel experience brought forth through reasoning, through the encounter with a stranger, or, more directly, through the expression of a biological interpersonal congruence that lets us see the other person and open up for him room for existence beside us. This act is called love, or, if we prefer a milder expression, the acceptance of the other person beside us in our daily living. This is the biological foundation of social phenomena: without love, without acceptance of others living beside us, there is no social process and, therefore, no humanness. Anything that undermines the acceptance of others, from competency to the possession of truth and on to ideologic certainty, undermines the social process because it undermines the biologic process that generates it. Let us not deceive ourselves: we are not moralizing, we are not preaching love. We are only revealing the fact that, biologically, without love, without acceptance of others, there is no social phenomenon. If we still live together that way, we are living indifference and negation under a pretence of love. Every human act takes place in language. Every act in language brings forth a world created with others in the act of coexistence which gives rise to what is human. Thus every human act has an ethical meaning because it is an act of constitution of the human world. This linkage of human to human is, in the final analysis, the ground­work of all ethics as a reflection on the legitimacy of the presence of others. To dismiss love as the biologic basis of social life, as also the ethical implications of love, would be to turn our back on a history as living beings that is more than 3-5 billion years old. We may resist the notion of love in a scientific reflection because we fear for the objectivity of our rational approach. Yet from what we have said in this book it should be apparent that such fear is unfounded. Love is a biological dynamic with deep roots. It is an emotion that defines in the organism a dynamic structural pattern, a stepping stone to interactions that may lead to the operational coherences of social life. Every emotion (fear, anger, sadness, etc.) is a biological dynamic which is deep-rooted and which defines structural patterns, stepping stones to interactions that may lead to different domains of operational coherences (fleeing, fighting, withdrawing, etc.). Likewise, to disregard the identity between cognition and action, not to see that knowing is doing, and not to see that every human act takes place in languaging and, as such (as a social act), has ethical implications because it entails humanness, is not to see human beings as living entities. To do that — now that we know how we know — would bespeak self-deception. Whatever we do in every domain, whether concrete (walking) or abstract (philosophical reflection), involves us totally in the body, for it takes place through our structural dynamics and through our structural interactions. Everything we do is a structural dance in the choreography of coexistence. That is why everything we have said in this book is not only a source for scientific exploration but a source for understanding our humanness. We have delved into a social dynamics which points up a basic ontological feature of our human condition that is no longer a mere assumption, that is, we have only the world that we bring forth with others, and only love helps us bring it forth. If we have succeeded in bringing the reader around to this reflection, this book will have achieved its second purpose. We affirm that at the core of all the troubles we face today is our very ignorance of knowing. It is not knowledge, but the knowledge of knowledge, that compels. It is not the knowledge that a bomb kills, but what we want to do with the bomb, that determines whether or not we use it. Ordinarily we ignore it or deny it, to sidestep responsibility for our daily actions, as our actions — all without exception — help bring forth and validate the world wherein we become what we become with others, in that process of bringing forth a world. Blind to the transparency of our actions, we confuse the image we want to project with the being we want to bring forth. This is a misunderstanding that only the knowledge of knowledge can correct. We have reached the end. This book has invited you, the reader, to make a reflection. Such reflection will lead you to know your own knowledge. It is up to you to make this knowledge the pith and substance of your action. "I want to swim to another land." "For that you have to learn how to swim. Are you ready to learn?" "Yes, but I want to take with me my ton of cabbages." "The food I'll need on the other side or wherever it is." "But what if there's food on the other side?" "I don't know what you mean. I'm not sure. I have to bring my cabbages with me." "But you won't be able to swim with a ton of cabbages. It's too much weight." "Then I can't learn how to swim. You call my cabbages weight. I call them my basic food." "Suppose this were an allegory and, instead of talking about cabbages we talked about fixed ideas, presuppositions, or certainties?" "Humm. . . I'm going to bring my cabbages to someone who understands my needs."